If you are brave then enter The Joker™ Manor! Help Batman™, Barbara Gordon, Alfred Pennyworth™ .. Celebrate with Superman™ and friends at the party! Recreate the hilarious scene from THE LEGO® ..
As Batman you can protect Gotham City from Bane’s toxic attacks! Stop Bane™ and Mutant Leader’s..
Help Batman defend against The Penguin’s Duckmobile invasion of the Batcave in THE LEGO® BATMAN MOVI.. Tear through Gotham City in pursuit of Man-Bat™ and the Kabuki Twins™ in the Batmobile. This set fro..
Use The Batwing to patrol the skies above Gotham City! 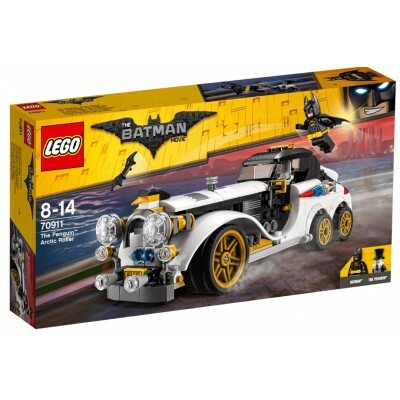 Fly high above Gotham City in the Batwin..
Recreate a face-off between The Joker™ and Batman™ at the Gotham City Energy Facility in THE LEGO® B.. Become a part of Batman’s pursuit of The Penguin in THE LEGO® BATMAN MOVIE: The Penguin™ Arctic Roll..
Attempt to take on four Super-Villains at once in THE LEGO® BATMAN MOVIE: The Riddler™ Riddle Racer ..
Make sure yo are on the right side of the Two-Face™ Excavator! Stop the mighty Two-Face™ Excavat..